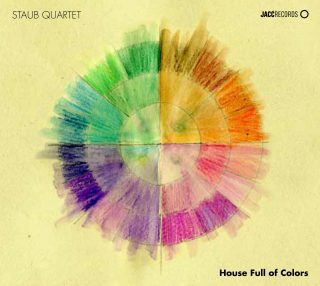 The symbolism contained in the existing link between the action of “letting in the light” and creative realization, is embodied in a sublime way through House Full of Colors, the debut album by STAUB Quartet. This cooperative project, rooted in the development of acoustic improvisation, brings together four essential figures of our time in European creative music: violinist Carlos “Zingaro”, guitarist Marcelo dos Reis, bassist Hernani Faustino and cellist Miguel Mira. The approach offered in this album debut of this quartet of distinguished musicians – all having emerged from today’s thriving Portuguese music scene – finds its inspirational epicenter in the concepts of light and color. This conceptual reference is embodied in the album title as well as the names of each piece while also giving life and nurturing a musical approach that yearns to explore uncharted creative territories. So claimed Paul Cezanne, “Light is not something that can be reproduced, but something that should be represented using something else”. The artistic testimony amalgamated by STAUB QUARTET in House Full of Colors, the means used for that representation, are sounds and music. Talking about color also involves talking about light; it is due to light that we see the shapes and colors of forms. However, with subsequent discoveries about how the brain interprets colors in “Color Theory”, outlined by Goethe, along with the current research in color psychology, it is agreed that color has a subjective value that is based on the phenomenon of human perception. There is no doubt that subjectivity can be fertile ground for the blossoming of an artistic idea that seeks to extrapolate the perception of color to music and, in the case of House Full of Colors, that aspiration materializes in a sublime manner. The album passes through different climates – mostly associated with the perception of color and light that gives it life – but finds a common denominator in its abstract nature (which is to say that it doesn’t respond to predetermined stylistic concepts), a spacious and relaxed exploration of the material (which comes from careful listening and mutual understanding with which they interact collectively) and the constant playful instinct that pervades the improvisational approach of the quartet. In its subtle journey, the music passes through the spacious contours and introspective calm of Quiet Arcs, the disturbing intensity that emerges from the complex sound structure exposed in Red Curtains, the fleeting and elusive character of Opacity Rings, the sonic flirtations and emphatic dramatics of Knots of Light, the haunting beauty of a dream-like atmosphere developed in Resonant Shades and the multi-weighted temperament open to myriad readings emanating from Discrete Auroras. All of it ranked by the quality of the ideas of its interpreters and framed in the context of a consummate collective delivery.